Whether it's the adrenaline rush of Sheriff's 3D racing car-themed slot, Cars and Cash, or the action junkies' paradise of Pimp My Slot, from developer, OpenBet, driving-themed video slots online are certainly popular. 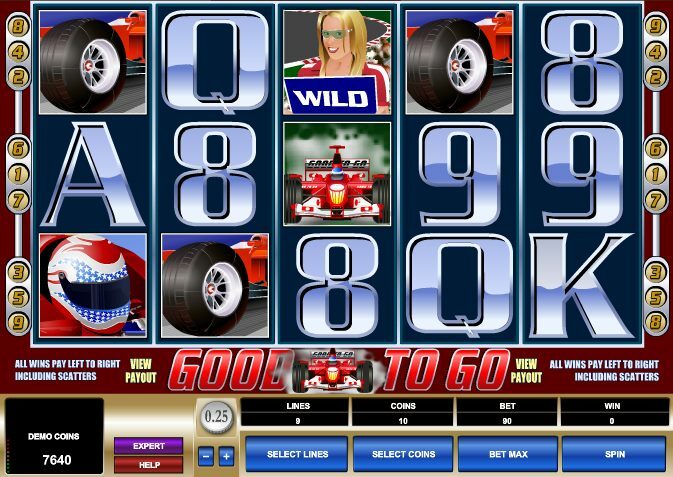 And slot developer Microgaming's addition to their online video slots portfolio, Good to Go, is worth a place in pole position. Taking its cue from the world of Formula 1 racing (complete with starting grid backdrops and pit girls galore), fans of Button, Vettel and Hamilton should get a real kick out of this. 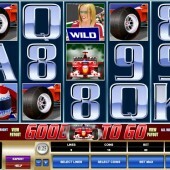 It is a slot that will certainly appeal to players that have enjoyed other racing car slots. Elsewhere on the reels in this 5 reel, 9 pay-line slot you’ll find plenty of logos, checkered flags, fat tyres and chrome-FX 7-through-Ace card symbols. Although there’s a reliance on card symbols, the overall feel is pretty authentic, and the animated symbols that flash away when forming a winning combo are nice. The Blonde Pit Girl Goes Wild! The blonde pit girl acts as the game’s Wild, and she substitutes for all regular symbols other than the Scatter. Five Wilds across the reels awards a pretty generous 5,000-coin jackpot, and with the top coin at $1.00 that can spell a nice little win for the relatively big bettors playing it. The Scatter, meanwhile, is the Rev Counter. Two Scatters left to right pays out, but three or more triggers three free spins. Not only that, but the reels featuring the Scatters will be held in place for the duration of the spins, meaning that you can reap even more bonus cashes. If more Scatters appear during the bonus round, they are held too. If the maximum five Scatters appear then the win is automatically repeated three times. For fans of F1 this is a great, if fairly basic, addition to the genre, and there’s still something of interest to non-racing enthusiasts (like me). However, for a bit more bang for your slots buck, check out the games I highlighted at the top of the review. You should also check out Microgaming's other car racing slot Racing for Pinks if you enjoyed this slot.